After 25 years on air, Oprah Winfrey signed off from her iconic syndicated talk show Wednesday morning. But she refused to say goodbye. "Until we meet again," she said. "To God be the glory." The talk show host leaves her No. 1 rated daytime show to run her OWN network full time from L.A. Though her plans have been known for sometime, watching her final show was bittersweet for many fans. Audience members were crying throughout the hour-long goodbye show on Wednesday. But for once, the show wasn't about the reactions of the audience. The final show, which marked Oprah's 4,561st day on set, was all about Oprah, and the talk show host didn't want to talk about melancholy feelings. "All sweet, no bitter," Oprah said about leaving. She has no regrets from her 25 years on the stage, besides not shedding light on more controversial issues. She said she would have liked to feature more stories on sexual predators. The final show was a stark contrast to the United Center spectaculars that led up to the finale. The preceding two shows were stocked with famous guests and extraordinary goodbyes from the likes of Maria Shriver, Michael Jordan and Will Smith. And Oprah enjoyed every second of them. "Did you see my face?" she laughs. But Wednesday's finale, which was produced by Oprah, was more about sweet memories. "This hour is really about saying thank you. This is my love letter to you." She brought on her fourth grade teacher, Ms. Duncan and thanked her staff, many of whom worked 18 hour days, for keeping the show on top for all those years. "I non-jokingly say my team and Jesus," she said about the secrets to her success. She also praised the more than 30,000 people whose lives were affected by her show, which often offered a venue where individuals, from celebrities to everyday folks, could unburden themselves of secrets and let emotions flow. "They all had the same thing in common," she said. "They all wanted validation." She wrapped up by offering a new email address with which viewers can reach her. 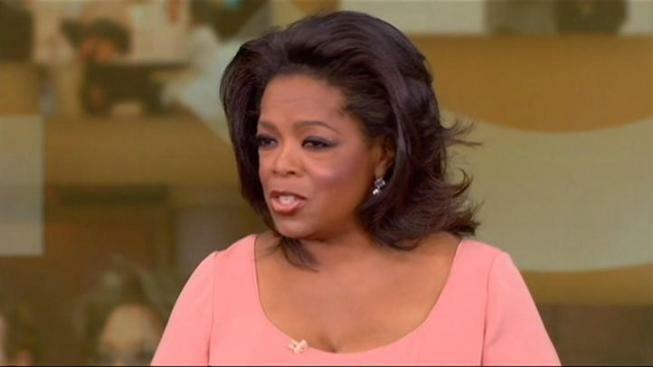 Oprah@oprah.com is for the people to use because: "I want you to know that what you have to say matters to me." "Thank you America, thank you so much," Winfrey says. "There are no words to match this moment. ... How truly amazing it is, this journey you and I have shared together."